AMEC WideLink R150GE is an AIS receiver designed especifically for shore monitoring applications but it can also be used like a normal AIS Receiver for small commercial vessels, fishing vessels, yachts, and sailboats. AMEC WideLink R150GE is an AIS receiver designed especifically for shore monitoring applications but it can also be used like a normal AIS Receiver for small commercial vessels, fishing vessels, yachts, and sailboats. 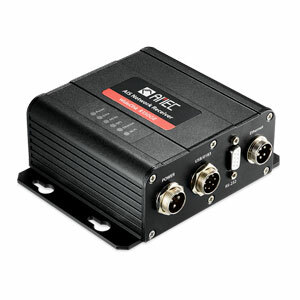 Built on the superior performance of CYPHO-150, R150GE provides extensive functionality including integrated GPS receiver and comprehensive connection interfaces. Employing two parallel AIS receivers, R150GE delivers superb receiving sensitivity to ensure maximum reception range of all AIS messages. R150GE is also fit to be deployed as receiving station on shore or remote locations and re-route AIS messages to the dedicated server or any designated IP address via the TCP/IP or UDP/IP. The user can also use the R150GE just like a standard AIS receiver by connecting it to PC or chart plotter via USB, serial port (RS-232) or NMEA 0183, and access AIS data conveniently on any portable devices wirelessly over Wi-Fi. Moreover, when connected to a GPS antenna the receiver will output AIS data together with own vessel´s speed, course, and location. The unit is equipped with standard USB, RS-232, Wi-Fi, LAN, GPS and NMEA0183 interfaces.